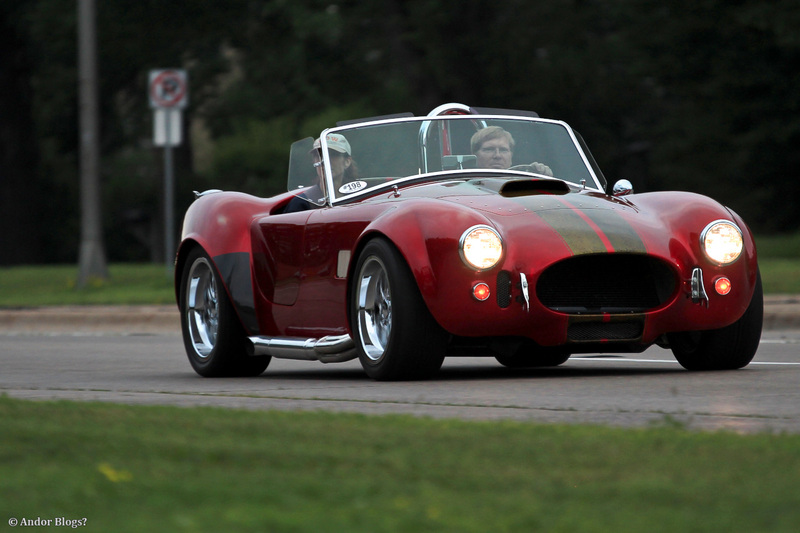 This weekend is the Car Craft Nationals here in Saint Paul, Minnesota. I have been taking a LOT of car pictures lately, so I opted not to attend the gathering it’s self. Instead heading out with My buddy Ryan Clemens of Opposition Motors, to post up on the side of Snelling, just out side of the show. 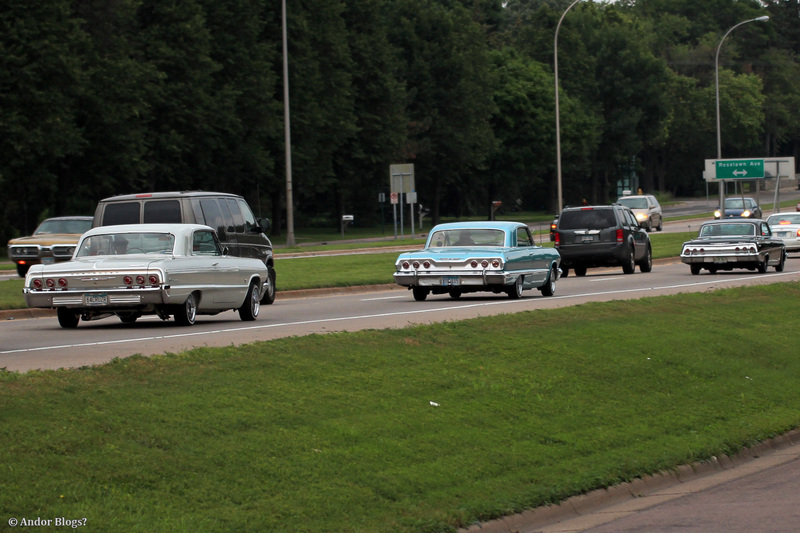 There was a very wide variety of vehicles out and about, mostly American made, spanning many decades, but there were some other cars out cruising too. It is nice to see classic and modern muscle cars, massive land boats from the 70’s and 80’s, low riders, high riding trucks, kit cars, sports cars and a whole lot more, out on the streets at once. This was like a throw back for Me. When I was Younger, University Avenue was the home of all things cruising. Every weekend there were thousands, upon thousands of cars and huge quantities of people out on the strip. We had one of the most robust car cultures in the world, on display, three days a week. Over the last ten to fifteen years, this scene has been broken up and dispersed, to the bain of an awful lot of local businesses. So many local and family owned restaurants and shops have gone out of business since the city started it’s campaign to end the cruising scene’s dominance of our weekend culture. Much of the blame lands on the shoulders of a large home for the elderly, building and expanding to become a sprawling complex, right on University, next door to the beating heart of this, now miniscule scene, Porky’s drive in. Naturally, the people at the Episcopal Homes complained heavily about the noise and abundance of people walking next to their building. 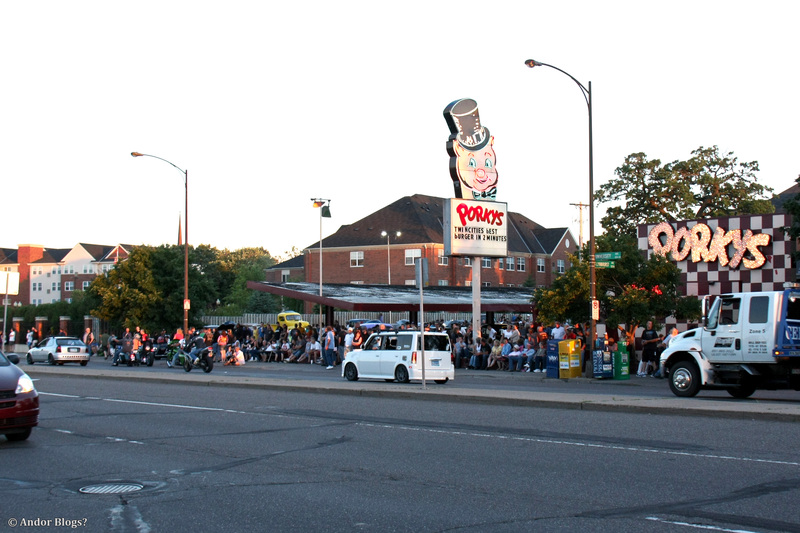 Sadly, three or four years ago, Porky’s, the lone 50’s style eatery left in Saint Paul and home to some of the best all American eat’s around, went out of business. I really, REALLY miss having My double supreme burger, with that great “special sauce,” the city’s best pork cutlet sandwich, the best onion rings I’ve ever had and a thick, chunky strawberry malt, whenever I want. Now I, as well as every one else, will never get to eat their great food again. Below is a picture from their last year in business. That crowd, is nothing compared to what was around for decades in the past. The massive bland buildings in the rear, are two of the four newest buildings of said retirement home. I am all for giving our elders reasonable homes, with care takers to look after them as best they can, but why choose the busiest street in a bustling part of town? Can You guess who expanded in to the space left when Porky’s died? I wish I had a better picture of this iconic eatery, but I don’t. In the end, all hope of the cruising scene on University being revived, was crushed by the construction of the recently completed light rail line, which runs right down the center of the street. The car culture is still visible, but since there is no place that everyone knows to go to, the numbers of cars out on the weekends are laughable. There is no where that You’ll find ten, or fifteen thousand people gathering, like in the past. So those of us who wish to re-live the sight seeing, less the food that’s not available anymore, must wait for two or three events per year. Back to the Fifties and Car Craft being the main draw. The local economy has been delt a pretty big negative impact overall. These hand full of gatherings do help a lot, but that doesn’t change the fact that the miles of road occupied by smaller businesses are now lined by endless corporate chain stores. Funneling money out of the Twin Cities. The general lack of low riders and imports out at these events is a huge loss of variety too, but at least we still have something! I guess.